Simple homemade style all natural cotton personalised stocking. Simple homemade style all natural cotton personalised stocking. Vintage look to this simple stocking made from 100% cotton fabric with overlocked hems and a little hanging loop to hang up in your home for the festive season. Makes a great alternative to gift wrap too! 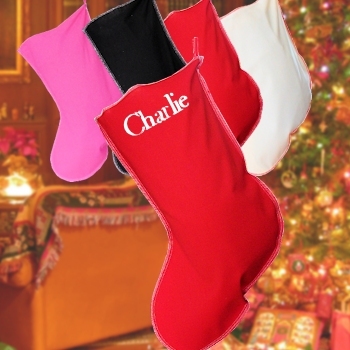 We will embroider a name or monogram with initials to personalise this stocking for you as a special keepsake. Personalised at the top with an embroidered name in shiny white Xmas Print or Fancy Script. (The first letter of a name is capitalised or initials, please check spelling before confirming your order.) Personalised gifts are custom made to order within approx. 3 working days.